Past residents are invited for short-term return visits. Grant Smith and Sam Baraitser Smith (London, UK). for residencies taking place between June and October. The Wave Farm Residency Program provides artists with a valuable opportunity to concentrate on new transmission works and conduct research about the genre using the Wave Farm Study Center resource library. Employing the electromagnetic spectrum, Transmission Art encompasses work in participatory live art or time-based art such as radio, video, light, installation, and performance, as well as a multiplicity of other practices and media, informed by an intentional act of transmission through space (often the airwaves). Please note that the Wave Farm Residency opportunity is explicitly designed to support new works within the Transmission Arts genre. A subgenre of the media arts, transmission art is defined as works where the the electromagnetic spectrum is an intentional actor (either formally or conceptually) in the work. The electromagnetic spectrum is vast including seven primary types of waves: Radio Waves, Microwaves, Infrared Waves, Visible Light Rays, Ultraviolet Waves, X-rays, and Gamma Rays. Radio-related projects, either conventional radio art works (audio made explicitly for radio broadcast) or do-it-yourself radio-based installation and performance where artists might build their own transmission and receiving devices are common manifestations of transmission art in action. Another common trajectory of the genre is making the ethereal tangible, for example works that demonstrate a physical delineation of space through sonic or visual representation: the architecture of transmission and reception. While in-residence, artists are provided with hands-on opportunities to interact with, and broadcast on, Wave Farm's WGXC 90.7-FM, a creative community radio station serving over 78,000 potential listeners in New York's Upper Hudson Valley, and international listeners online. Women and people of color are encouraged to apply. IMPORTANT NOTE: Wave Farm uses Submittable in conjunction with our application-based programs. Applicants are strongly encouraged to carefully read the information below in detail before submitting an application. Please contact info@wavefarm.org with questions. Tuesday: Meeting with staff to discuss and plan broadcast opportunities, etc. Second Saturday: Afternoon Show Broadcast, 4 - 6 p.m. Wave Farm Artists-in-residence receive a $700 artist fee. Click for Property Map and Video Tours. The Residency Program hosts one artist at a time. Artists, which may include collaborative teams, are housed in the Wave Farm Study Center. 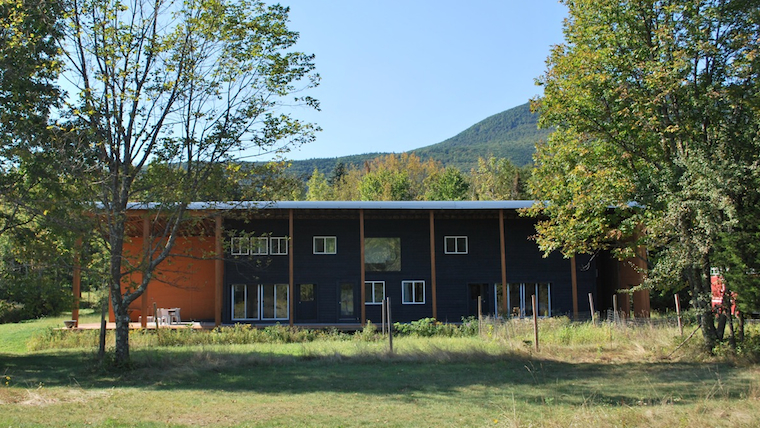 Accommodations in the Study Center include two bedrooms (one full-sized bed each), studio workspace, kitchenette, lavatory, shower, as well as the Study Center library, WGXC 90.7-FM Acra broadcast studio, and Wave Farm offices. 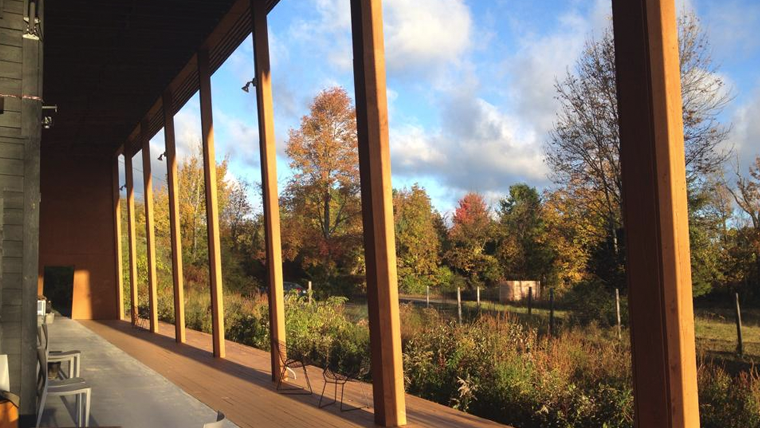 The Study Center is located on 29 acres in the northern foothills of Catskill Mountain Park. 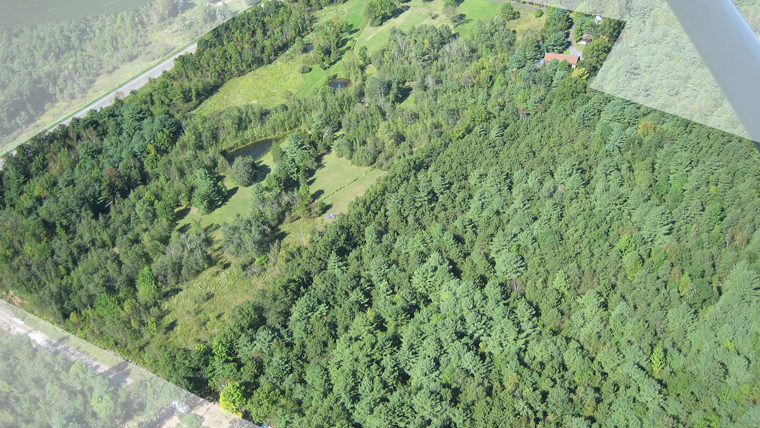 The property features meadows, two small ponds, and a pine forest with large walking paths. WiFi, electrical, and audio hook-ups are available throughout the bulk of the property. Please note: day visitors are welcome. Overnight guests (including family members) and pets are not permitted. Artists must pay for their own travel expenses as well as expenses related to meals during their stay. Transportation is available from the Hudson Amtrak station, the Kingston bus station, or the Albany airport, as well as local transport for groceries and supplies. This is a call for all types of transmission art project proposals. Wave Farm's Residency Program application is an international open call. Artists should make a compelling argument in support of their proposed transmission art project, and either possess a significant body of past transmission-based work, or demonstrate the technical aptitude and capacity to complete the project. Full-time students are ineligible; however, exceptions may be made on a case-by-case basis for career artists who may have returned to school for post-graduate work. Applications will be evaluated in a peer review panel comprised of transmission artists, past residents, and Wave Farm staff. Finalists will be contacted for phone interviews, and notification will be made in March. Once an artist participates in the Wave Farm Residency Program, schedules permitting, they are invited to return to Wave Farm for short-term overnight visits that include a broadcast on Standing Wave Radio and Wave Farm’s WGXC 90.7-FM. There is no cash artist fee available for these visits; however, overnight accommodation in the Study Center and transportation to and from the Hudson Amtrak station are provided. With advance permission, artists are welcome to bring a guest with them. This opportunity is available on a case-by-case basis, and artists are encouraged to make a request as far in advance as possible. To request a visit please CLICK HERE. Artists are invited year-round to propose special projects for Saturday and late night broadcast on Wave Farm's WGXC 90.7-FM. Please send a detailed inquiry to info [at] wavefarm.org.